Strong local support, a good economy and a thriving university help create a rising food and beverage scene in Ohio’s capital. Columbus’ on-premise offerings rival those of larger cities. 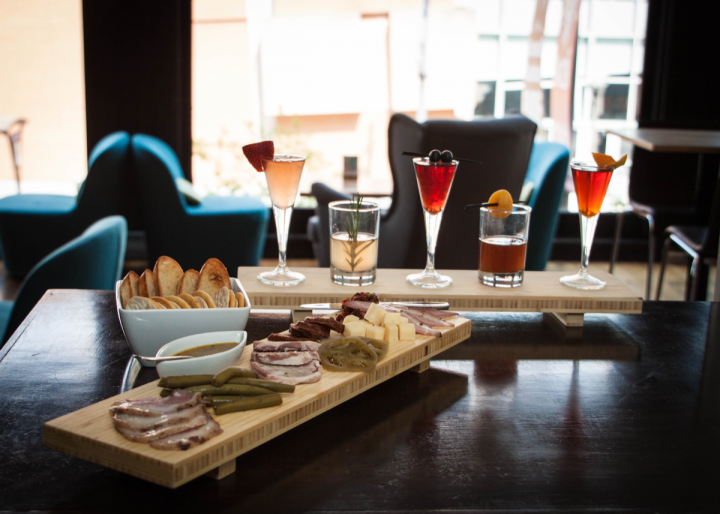 Denmark on High pairs cocktail flights with charcuterie (pictured). Local pride is alive and well in Columbus, Ohio. On Saturdays during college football season, if they’re not at The Ohio State University (OSU) cheering on the Buckeyes, local residents are watching their beloved Big Ten team on television screens at the city’s sports bars. Support of homegrown businesses also runs deep in Ohio’s capital city, especially when it comes to drinks and dining. “Columbus loves to support Columbus,” says Greg Lehman, co-owner of Watershed Distillery—one of two craft distilleries located in the city. Others count local patrons among the reasons that Columbus bars and restaurants are enjoying remarkable growth. “There’s a strong ‘drink local’ spirit in Columbus,” notes Andy Dehus, co-owner of Columbus Food Adventures. The business offers tours of some of the city’s hottest restaurants and craft breweries. Jason Fabien, general manager at Barley’s Brewing, agrees. “Being local is a big thing here,” he says. Founded in 1992, Barley’s is the city’s oldest continuously operating brewpub. Named for Christopher Columbus, Ohio’s largest city was founded as the state capital in 1812 and sits on the Scioto River. Today, Columbus encompasses 223 square miles and is the 15th-largest city in the country. High Street runs north-south through the city center, which boasts several historic and trendy neighborhoods. Located north of Downtown, the Arena district has seen significant growth over the last 15 years—particularly in restaurants and entertainment venues—since the opening of Nationwide Arena, home to the National Hockey League’s Blue Jackets. Due north of the arena, the Short North arts district is currently the city’s hottest neighborhood and features art galleries, specialty shops, bars, nightclubs and coffee houses. “The success of the Short North is pushing development in areas nearby,” says Beth Ervin, communications director at the Experience Columbus marketing organization. “Downtown is undergoing a renaissance as more and more people want to live there.” The OSU campus area further to the north is also exploding, she adds. While Columbus didn’t escape the recession, it fared relatively better than other major cities. The Ohio capital is home to several major corporations, including Nationwide Insurance, Abercrombie & Fitch, Express Inc., and Victoria’s Secret owner L Brands. Melissa Myers, district manager at Republic National Distributing Co., oversees spirits sales in Columbus for the wholesaler and attributes much of the city’s vibrancy to OSU. “Many students stay here after graduation,” she says, noting that the school provides an educated workforce readily available to employers. “Young professionals like living in a downtown area, and Columbus is affordable,” adds Mike Hermick, co-owner of Downtown’s Chintz Room restaurant. Residential construction is booming in the city, and Hermick adds that more than 1,000 residential units are in the process of being built just within blocks of the restaurant. Barley’s Brewing (flight pictured) has produced craft beer in Columbus for over two decades. OSU is also widely credited with bringing enormous cultural diversity to Columbus, and that variety is reflected in the city’s eateries. Dehus of Columbus Food Adventures cites easy access to Chinese and Korean cuisine and points to an expanding immigrant and refugee population, which has given rise to restaurants featuring Somali, Nepalese and Ethiopian dishes. Cameron Mitchell's The Barn at Rocky Fork Creek emphasizes American whiskies and Bourbon cocktails. Ryan Valentine, beverage director at Cameron Mitchell Restaurants, says emphasis on a good drinks program is contagious. “When you see people doing great things, it inspires others,” he explains. The company operates more than a dozen specialty restaurants in the Columbus area. Cocktail menus in Columbus range from pre-Prohibition classics to cutting-edge concoctions. Denmark on High, which opened last year near the convention center, specializes in vintage and modern cocktails, and its list of about 30 signature drinks ($8 to $16) changes seasonally. One popular offering from the spring menu is the Spring in Manhattan ($13), made with Bulleit rye whiskey, Nonino amaro, strawberry rhubarb shrub and house-made lemon bitters. “I approach cocktails like I do food,” says White, who has a background as an executive chef. As a result, many of the ingredients he uses are made in-house, including juices, syrups, shrubs and bitters. As much as 90 percent of Denmark on High’s sales come from cocktails. Travis Owens, co-owner and bartender at Curio at Harvest in the city’s historic German Village neighborhood, describes his 3-year-old venue as a “classic cocktail bar, with a hefty amount of variation.” Indeed, signature drinks ($11 to $12) at Curio are creative and complex. Owens’ “Curious Concoctions” menu highlights seasonal selections ($12), such as the Monkey Business, comprising Leblon cachaça, Meletti amaro, Giffard Banane du Brésil banana liqueur, lemon juice and Angostura bitters. The venue also features draft cocktails like the Moscow Mule ($11), made with Watershed vodka, lime juice and ginger beer. Owens, who has worked in the bar business in Columbus for nearly 15 years, reports that spirits account for as much as 85 percent of Curio’s bar sales. This summer, he and some partners are preparing to open Salt & Pine, a 10,000-square-foot pub in Downtown that emphasizes draft cocktails. Mouton, a 5-year-old venue in the Short North, is also known for its cutting-edge, crafty drinks ($8 to $12). According to bar manager Logan Demmy, variations on classic cocktails ($10) like Manhattans and Old Fashioneds are most popular. 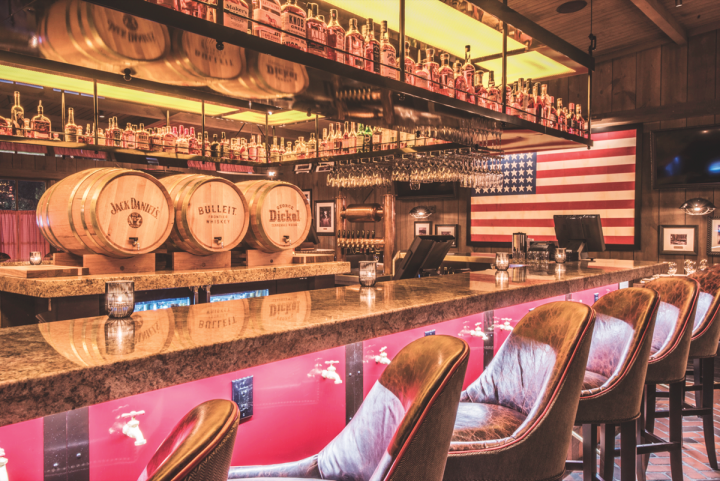 Up to 90 percent of Mouton’s sales come from beverages, driven by spirits, and the bar doesn’t use well brands, instead opting for offerings from distilleries like Columbus’ own Middle West Spirits. 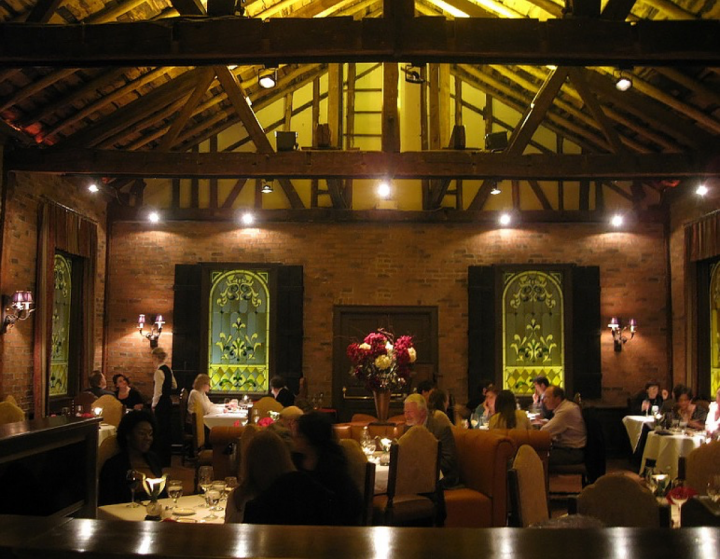 Housed in a former church complete with stained glass windows, the Refectory is a Columbus staple, offering upscale French and American fare alongside a thoughtful and expansive wine list. When it comes to wine, the Refectory Restaurant & Bistro frequently receives the nod for its extensive selection and depth. Owned by Kamal Boulos since 1977, the Refectory is located in a former church and features stained-glass windows and soaring rafter beams. Chef Richard Blondin—a James Beard Award nominee—studied under Paul Bocuse and turns out classic French and contemporary American cuisine. More than 80 percent of the venue’s beverage alcohol sales come from wine, with spirits accounting for 15 percent and beer comprising the remainder. General manager Jeff Elasky, a 30-year Refectory veteran, oversees the wine list, which boasts between 600 and 700 constantly changing selections, priced from $19.95 a 375-ml. bottle of the 2013 E. Guigal Côtes du Rhône to $5,996 for the 1970 Château Pétrus. The Refectory’s wine menu is broken down into two main sections: one for general wine consumers and one for more wine-savvy guests. The general wine list is organized by flavor descriptions, such as “structured, medium-bodied and lush” white wines and “bold, rich and complex” reds. “The strong point of our menu is the list of cellar selections,” Elasky says. “Our older vintages of Bordeaux, along with cellared Cabernet Sauvignon from California, are wines that guests will not find elsewhere in Columbus.” For consumers looking to expand their wine knowledge, the restaurant offers a regular calendar of events, ranging from walk-around tastings to sit-down dinners. Beer is certainly no afterthought in Columbus. Among venues that emphasize beer is the 2-year-old Crest Gastropub, located in the Clintonville area. A unit of A&R Creative, headed up by Ali Alshahal, Crest carries 57 craft and imported brews on tap ($5 to $12 a draft pour). An additional 46 offerings are available in 12-ounce bottles and cans ($2 to $12). Crest also hosts numerous beer-driven events, including nine separate occasions during the recent Columbus Beer Week, according to manager Peter Hille. “Our chefs like to get involved in pairing dishes to beers,” he says, citing full-fledged beer dinners ($75 to $150 a person) or particular courses paired with a beer ($8 to $20). Hille adds that A&R is planning another Crest location in the Old Town East section of Columbus and is partnering with Marengo, Ohio–based Hoof Hearted Brewery to open Hoof Hearted Brewery & Kitchen in Columbus’ Italian Village neighborhood by the end of the summer. The Guild House offers a deep wine list and artisanal cocktails. In addition to single-unit venues that are leaving their mark on the Columbus food and drinks scene, multi-concept operators like Liz Lessner’s Columbus Food League and Cameron Mitchell Restaurants are also contributing. 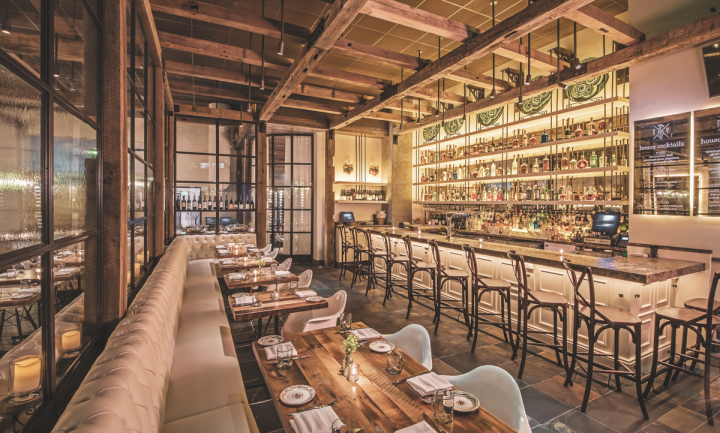 Lessner fronts five different concepts at six locations—Torpedo Room, Grass Skirt Tiki Room, Tip Top Kitchen & Cocktails, Dirty Frank’s and her partnership with Hermick, the Chintz Room. 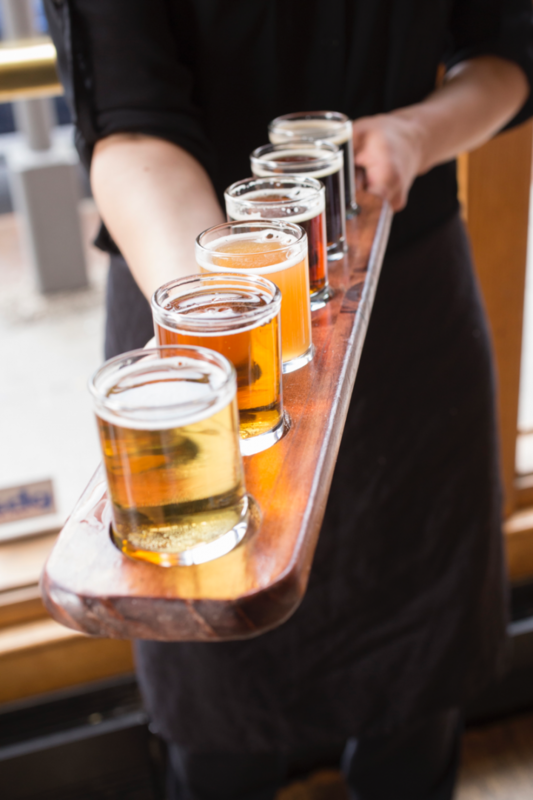 Lessner says that while the beverage alcohol mix at each venue varies, “beer usually leads,” accounting for about 60 percent of beverage sales, followed by spirits at 30 percent. At the Chintz Room, 18 craft brews are poured on tap ($5 to $6.50 a 16-ounce pour), while throwback bottled beers like Schlitz and Stroh’s are offered for $1 to $2. Hermick adds that craft cocktails ($8 to $9) are also exploding, citing such top-sellers as the Escalator ($9), made with lemon-infused Watershed gin, St. Germain elderflower liqueur and lime juice. At Cameron Mitchell Restaurants, wine accounts for more than half of total beverage alcohol sales, followed by spirits at roughly 40 percent and beer at less than 10 percent. While the company operates about a dozen Ocean Prime supper clubs around the country, its specialty division comprises 10 primarily single-concept venues, all in the Columbus area. Recent additions include The Joseph in Short North, the Guild House—adjacent to Columbus’s first boutique hotel—and The Barn at Rocky Fork Creek steak house, located about 15 minutes from Columbus in Gahanna. Drinks highlights at the Guild House include the seasonally changing Porthole cocktail for two ($20), which recently comprised chamomile-infused Corzo Blanco Tequila, Cointreau orange liqueur, orgeat syrup and lemon juice, and a wine list featuring unexpected offerings like the 2010 Châteauneuf-du-Pape Château Mont-Redon Blanc ($21 a glass). The Barn, meanwhile, boasts a Bourbon lounge pouring more than 70 American-made whiskies ($7.25 to $18) and Bourbon cocktails ($10), such as a barrel-aged Manhattan. 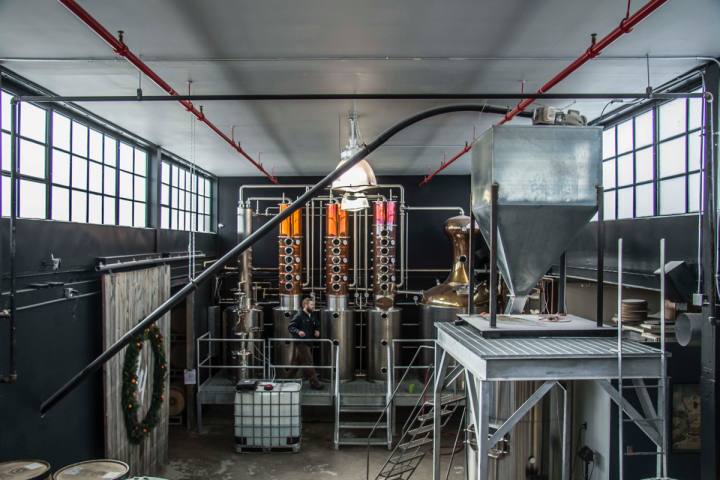 Since its founding five years ago, Watershed Distillery has greatly expanded, and it now sells vodka, gin and Bourbon in a number of states outside Ohio. “We’re very lucky that in Columbus we have so many new distilleries and breweries,” Columbus Food League’s Lessner says. “We even have a meadery,” she adds, pointing to Brothers Drake Meadery. Indeed, Fabien of Barley’s Brewing notes that there should be 20 craft breweries in operation in Columbus by the end of the year, and that number doesn’t include the pending outpost of the popular Scottish craft brewery BrewDog that was announced in April. Barley’s Brewing is also on the fast track: It expects to open a 12,000-barrel capacity production brewery on High Street this fall, allowing the company to expand distribution of its products beyond the 20 or so on-premise Columbus accounts it currently serves. The plan is to satisfy local demand. “We don’t want to sell in Toledo or Cincinnati,” Fabien says. Other Columbus-area craft breweries and brewpubs include Columbus Brewing Co., Seventh Son Brewing Co., Rockmill Brewery and Zauber Brewing.